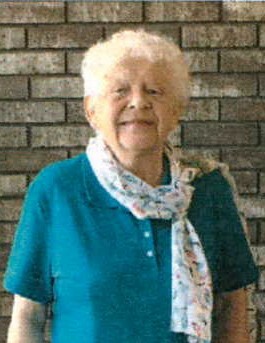 Obituary for Carolyn Hope Dagen | Kroeze-Wolffis Funeral Home, Inc.
Mrs. Carolyn Hope Dagen (Little woman with a song of hope for the day), age 81 of Fremont, flew into the arms of her Savior early Saturday morning, April 13, 2019. She was born on December 7, 1937 in Bitely, Michigan to George E. & Mildred A. (McCaman) Carpenter. Carolyn had been a lab technician, home health care specialist, missionary to HCJB, & executive secretary at Cytec in Boston, Massachusetts. She retired to take care of her mother in the early 2000's. In her retirement she enjoyed her family & church family, knitting, crocheting, & other handwork. She also loved music, especially playing her dulcimer. On March 26, 1960 she married John Dagen and he preceded her in death in 1985. She was also preceded in death by her mother, Mildred A. Gingrich; father, George E. Carpenter; and step-father, Harrison L. Gingrich. Survivors include her daughter, Rhonda (Scott) Smith of Muskegon, MI. ; her son, Glen (Patti) Dagen of Cabot, Arkansas; 6 grandchildren & 2 great grandchildren; 2 brothers: Gary (Francis) Carpenter of Reed City, MI., Eugene (Marilyn) Gingrich of Zeeland, MI. ; and several nieces & nephews. Cremation has taken place and there will be a time of visiting with the family at Faith Baptist Church in Fremont from 10:30-11:00 AM on Wednesday, April 17, 2019 followed by a Memorial Service at 11:00 AM on Wednesday at the church with Pastor Bryan Tanis officiating. A luncheon will immediately follow the service at church. Interment will be at Lakeside Cemetery in Muskegon. Suggested Memorial: Faith Baptist Church. You can sign the online guest book at www.kroeze-wolffis.com. Arrangements are by Kroeze-Wolffis Funeral Home, Inc. of Fremont.